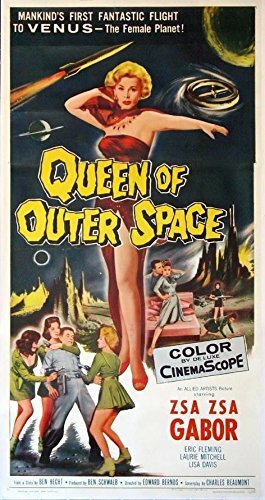 ITEM : Original U.S. 3-Sheet (41 x 81 inch) Movie Poster fromthe 1958 Science Fiction Fantasy "The Queen of Outer Space" starring Zsa ZsaGabor. CONDITION :This poster has been professionally linenbacked withminor touchup to some of the fold lines. Condition is Very Fine on linen. ITEM : Original U.S. 3-Sheet (41 x 81 inch) Movie Poster fromthe 1958 Science Fiction Fantasy “The Queen of Outer Space” starring Zsa ZsaGabor. CONDITION :This poster has been professionally linenbacked withminor touchup to some of the fold lines. Condition is Very Fine on linen.